Patrick, Mike, and Adam Thas are all wet. When I was a kid the Sound of Music used to come on around Easter. I was also unware that Nazi we’re in it. I knew I was not alone! That was a New Zealand thing as well. Sound of Music, Wizard of Oz and Annie always played during the holidays. I respect you guys, and I enjoyed this episode because you’re so much fun together. Still, I disagree with almost everything about Aquaman. I really loved that movie, and I think it’s just the movie they set out to make. I don’t see the need for every superhero movie to be a deep character piece just because Iron Man and Batman Begins exist. Sometimes, they can just be a big, crazy action flicks. We used to be ok with action movies just being action movies. And I think the action in this movie is GREAT. I found this one of the most purely entertaining films I saw all year, and I fell so hard in love with the world that it sent me running to the comic books, which I also now love. No comic book movie has done that for me for about a decade. That’s special. And regarding Arthur letting Manta’s father die... Aquaman is not a Captain America style boy scout. He’s not always good and sometimes he doesn’t do the right thing. And he learns from that mistake in this movie. I don’t think it’s a bad moment at all. And the line is “You ask the sea for mercy” which is a better line than “justice” and I also don’t think it’s a bad line. But to each their own! It’s probably just not for you. Have fun with the comic. I strongly urge anyone to start with the Peter David stuff. There is some really bad Aquaman before that. So far I’m just on the New 52 stuff. It is fantastic. It’s exciting discovering one of your new favorite superheroes as an adult. Another funny detail from Aquaman, there are numerous scenes of Atlantians (is that the correct pluralization??) riding on whales and sharks miles and miles below the surface. I never once saw one of the whales have to come up for air. Do whales not need oxygen in the DCEU? I haven't heard the pcast yet - so I don't know if y'all brought it up - but while watching Aquaman, my wife leaned over to me and pointed out that many of the scenes were pretty much stolen from 'The Little Mermaid' - the marketplace scene is one that comes to mind. There is an adorable geeky buffoonery that bubbles away whenever Adam Thas and Mike appear on the podcast together. Also good to hear Hellraiser Ringo join the ranks of other implausible characters in the FTM rogues gallery alongside Gentlemen Dalton and Mark Jones. 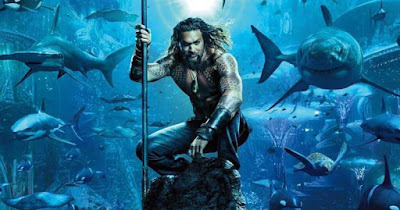 While I land more on the 'fun' side of Aquaman, you guys definitely hit upon the reasons why I ultimately found the movie a bit taxing. All in all, a great episode. Love it! Damn. I meant Highlander. You know what I meant. For the record, my Rob Liefeld name is Blast Steel. Great podcast, cool dudes! For Aquaman, count me in the at-least-it's-fun (ATIF) category. I agree the movie has its flaws (Why wasn't Kidman playing the Dafoe part in the flashbacks?!?) but I nonetheless walked out of the theater with a big ol' grin on my face. All this Venom talk has me considering how one person's ATIF is another person's that-movie-was-dreadful. In 2018, I thought Tomb Raider, Solo, Incredibles 2, The Predator, and even Venom were ATIF, while Skyscraper, The Meg, Jurassic World and Fantastic Beasts were just dreadful. I know a lot of you will disagree with me on these, but hopefully it's all good. Listening to this episode was a weird experience, where I agreed with many observations, but came to the exact opposite conclusion. I too laughed out loud whenever someone said Ocean Master. Especially when Patrick Wilson proclaiming himself Ocean Master was accompanied by ominous music. I feel like a lot of superhero movies have a layer of ironic detachment that Aquaman deliberately lacks. There is no Robert Downey Jr. off to the side making wry jokes at the expense of the concept; instead the movie pretends that hearing someone call themselves Ocean Master is genuinely chilling. That is part of what I loved about the movie. There is a sort of barely restrained absurdity to the whole thing that, for me at least, simply works. Of course, I am a person who counts Flash Gordon among all-time favorite movies, so this sort of thing just works for me. I will disagree with the necessity of Black Manta and the focus on Aquaman as a character. I thought there was a pretty clear and effective throughline of growth for Aquaman as a character and Black Manta was a big part of that. From Aquaman leaving Manta's dad to die at the start, then his talks with his dad and Mera and most of the movie happens, then he meets back up with Manta and realizes that even if he wasn't wrong to leave the guy to die, (and dude brought all of his misfortune on himself) doing so created an enemy that didn't have to be, which concludes with Aquaman refusing to finish Orm at the end. It isn't the most insightful arc ever, but I found it effective. Agreeeed. I really loved this movie because James Wan knows how to get what he wants on screen. It was silly, but took its sillyness serious...if that makes sense. You pointed that out with the Ocean Master thing. That was straight from a cartoon. I really like Stuckman's take on this movie. You put it exactly how I wanted to. I completely agree with this. My breaking moment was when Ariel made the joke that Momoa smelled bad while they were underwater, then he smelled himself (underwater), then i was like wait, what? His superpower includes smelling underwater? How dumb. Wait, sharks can smell blood in water...so its canon? I guess he can smell stuff underwater. I'm now missing the movie wondering about this stupid joke. Am I overthinking or underthinking this crap? Now the majority of netflix original films belong in straight to DVD bins. Despite offering mediocrity, I've spoken to so many netflix users that feel Netflix content is great cinema! My suspicion is majority of netflix users feel this way. it's my theory that when something that resembles a quality film is released with a bigger name attached, (Birdbox), that movie then becomes a phenomenon sensation despite being only marginally good. Birdbox is a medium sized fish in a pond filled only with small fish and caught by fishermen that have never seen any fish larger than a guppy. is my apt, best analogy ever to explain it's popularity.